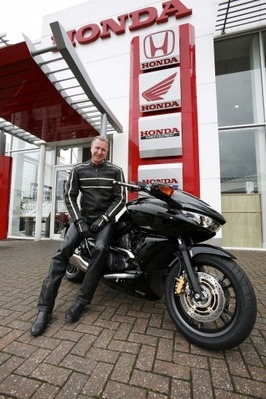 Legendary TV director and producer – Ed Bye - has chosen the unique Honda DN-01 for his regular commute across the UK’s capital. As the main man behind some of the UK’s favourite alternative comedy programmes and films, Ed has worked with the likes of French and Saunders, Lenny Henry, Adrian Edmondson, Rik Mayall, Harry Enfield, Eddie Izzard, Jasper Carrot and Ed’s own wife, Ruby Wax, in shows such as Absolutely Fabulous, Red Dwarf, Bottom and most recently on the BBC show, After You’ve Gone. Collecting his DN-01 in Graphite Black from Honda Chiswick, Ed commented, “I’ve been following the progress of the DN-01 since inception to production, and to be honest I began to doubt it could possibly fulfil my expectations. It was with some scepticism that I went on a test ride and I was prepared to be disappointed. However, the seamless power delivery, comfort and handling converted me straight away. My work takes me from BBC Television Centre to Soho and to TV studios in Teddington, Middlesex and Pinewood. Ed isn’t the only person knocked out by the performance and looks of this highly original machine. Many pre-orders and deposits were taken for the DN-01 following the bike’s UK unveiling at the International Scooter and Motorcycle Show at Birmingham’s NEC in December last year before the bike went on sale at the beginning of August. The DN-01 had its world media launch at Lake Como in April, where journalists praised the machine’s futuristic looks and the user-friendly nature of the new HFT (human-friendly transmission) system. The DN-01 is a truly unique machine in the world of motorcycling. It’s not a sportsbike, a cruiser, a scooter, a naked bike, adventure bike or a sports-tourer: instead it’s a new-breed of machine which couples performance, poise, comfort and practicality, all wrapped up in futuristic styling and boasting some of the latest Honda technology. Honda’s DN-01 represents a whole new direction for motorcycling, featuring Honda’s new ‘Human Friendly Transmission’ and an aesthetic design that looks like nothing else on Earth. Power comes from the proven and punchy compact 680cc liquid-cooled, fuel-injected V-twin engine, feeding through the HFT system, which offers auto, sports-auto or thumb-operated manual transmission modes, all providing motive force to the rear tyre without fuss, lag or any ‘snatchy’ feeling sometimes found on traditional scooter automatic transmission systems. The low-slung chassis keeps the rider in total comfort and control, while Honda’s superb Combined ABS Braking System enhances braking efficiency and safety. To find out more about the DN-01 or other models in the Honda motorcycle range, visit honda.co.uk or visit your local dealer. Honda motorcycle dealers can be located using the ‘Dealer Search’ facility within the motorcycles area on honda.co.uk, where you can also find all the latest news and information about the full Honda motorcycle range, offers, genuine parts and accessories and forthcoming events.